This Cricket Board, Selection Committee and the Government are Same. all the Plunderers are in these Big Three. I am not sure if this matter is this straight forward i.e. just because Shaw has played test and got a hundred Hasitha should. Firstly Shaw plays first class cricket in Mumbai which it very different to SL. Shaw also got a bit of IPL cricket in which allowed him the change to get a look in at the best bowlers in the world. Having said all of this, SLC should draft this guy in and see what he has. 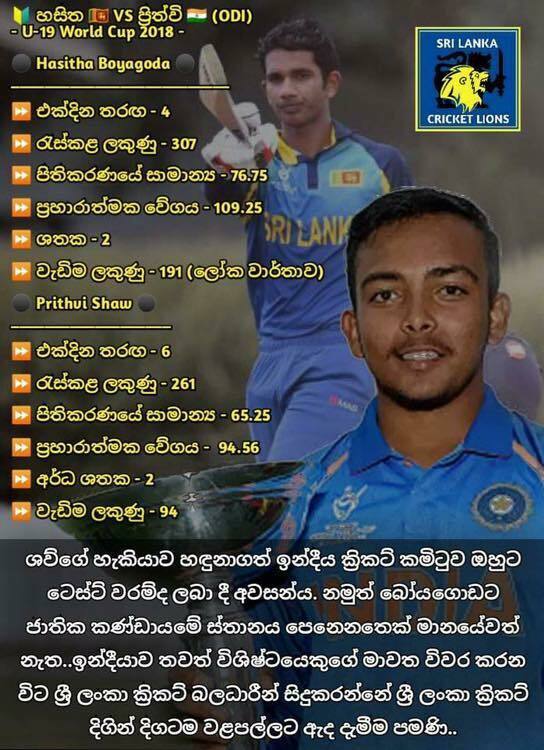 Lets face it, we are still messing around with Tharanga and co who are hit and miss merchants at the top of the order since Sanga and Dilly left so why not get a talent and nurture it. Yes, that was SLC are supposed to be doing. The BCCI does this well. Yes they also loot but atleast they have made sure Indian cricket is competing (well they are #1 in tests) while looting.